Welcome to Day 4 of the 12 Days of Holiday Inspiration Blog Event brought to you by "The Inspiration Crew". We’re a group of online crafty blog friends who love being creative. This time we're doing a 12-day event to provide you with tons of Holiday Inspiration. 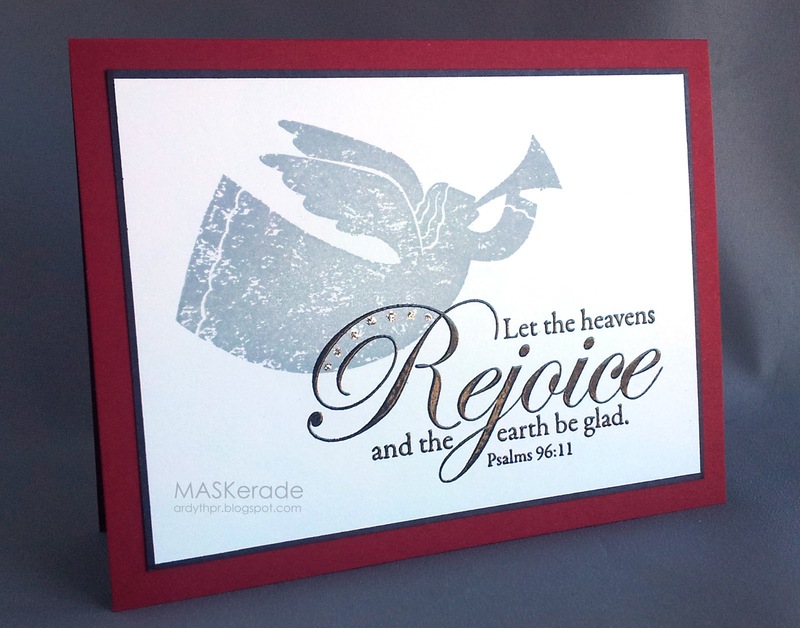 This is another simple card I made 24 times for my Church Christmas Card project. I used a Stampin' Up Angel stamped in Smoky Slate, a Stampabilities sentiment stamped in Versafine Onyx and embossed with clear embossing powder. I finished it with some dots of silver Stickles. To save paper, I created the black border by running a thick marker around the edge of the paper. Don't forget to visit all the crafty ladies participating in this event each day for loads of fun Holiday craft ideas! I love the slightly distress feel of this angel. Beautiful as always. The bold sentiment is so striking, and I love the angel. Lovely card.I would have never known that you used a marker to go around the edge. It looks perfect! Awesome hand drawn border....and soooooooo straight! Love the swirly sentiment and the stickles!!! So pretty - love the CAS look. So gorgeous! This is such a great classical Christmas card. This is beautiful and I like the touch of silver you added with the dots! Wonderful--I like the angel stamped in slate. Awesome sentiment, love the distressed angel. Stunning angel and I love your bits of bling under the r in rejoice. So beautiful Ardyth.